Custom massage that is infused with CBD oil with your choice of aromatherapy that is custom blended at the time of service. It has anti-inflammatory benefits, helps boost the immune system, reduces anxiety, promotes a sense of calmness and relaxation, and helps alleviate chronic pains. Whether you are looking for deep relaxation or seeking relief from pain, this service is for you. We offer 90, 60, and 30 Minute CBD Oil-Infused Massages. 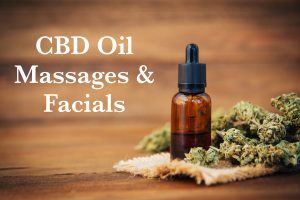 This facial is infused with CBD oil with your choice of aromatherapy that is custom blended at the time of service for individualized skin care. CBD oil has anti-inflammatory benefits and promotes a sense of calmness and relaxation. Our top of the line facial begins with a thorough cleansing and skin analysis, followed by extraction of blackheads or whiteheads if required. A custom mask and gentile fruit enzyme peel are applied to remove any dead skin and reveal the bright new skin underneath. Includes a relaxing scalp, face, neck and shoulder massage. Designed for your exact complexion, this personalized facial is totally customized from start to finish. Cannabidiol (CBD) is one of 85 compounds, known as cannabinoids, found in the cannabis sativa hemp plant. CBD oils made from hemp contain non-psychoactive cannabidiol. Non-psychoactive means that it does not produce a euphoric or psychotropic effect when used. Hemp products like CBD oil are completely legal and available across the United States. "CBD stands out because it is both nonintoxicating and displays a broad range of medicinal applications, including anti-inflammatory, antioxidant, anti-anxiety, and analgesic (pain relief) properties,"
Curious about CBD Oil? Read our articles! If you are suffering from a sports injury, overworked muscles from working out, or chronic pain, a CBD Oil-infused massage may provide pain relief. Since your therapist can incorporate it into your session and apply it directly to the painful area, the reduction of localized pain is often experienced. Inflammation is a protective and healing response in the body, but during the healing process inflammation can sometimes worsen medical conditions when it becomes overactive. Common discomforts from overactive inflammation can include rheumatoid arthritis, sports injuries, occupational injuries also known as repetitive strain, and tendinitis. The addition of CBD oil to a massage has been shown to reduce inflammation of the muscles and joints by telling the overactive immune cells to stop doing what they're doing and also stop recruiting more immune cells to the area. CBD has the ability to decrease muscle spasms and help muscles relax. A study conducted by the World Health Organization found no evidence correlating any public-health-related problems with the use of pure CBD. CBD is generally well-tolerated and does not induce physical dependence. However, there could be a chance of an allergic reaction since it's applied topically so our therapists will test a small area of your skin before the massage begins. Select a treatment by clicking anywhere on the 'Select Appointment Type' drop-down menu and then selecting the treatment from the list. Select a therapist by clicking anywhere on the 'All Therapists' drop-down menu and then selecting the therapist from the list. Click the Search button. This will show the available appointments for the treatment, therapist, and date you chose below the calendar. If you do not see the scheduling feature below, it will appear momentarily.